Are any of your friends getting married soon? Did you just answer yes? If you did, you’d definitely need a cool wedding wish to send to them on that nuptial ceremony of theirs. And as luck would have it, we have dozens of wonderfully constructed wedding messages here that you can use to make that occasion an extra special one for your friend. What are you waiting for? Go ahead and make your selection from the fine list below! I welcome you to the world of the married. I pray nature bestows upon your home the choicest of her gifts and blessings to aid you sail through your marriage happily. I hope you listen carefully to the words of the vows before you say, “I do”. Anyway, do have a blessed marriage. We’ve made lots of memories together, but today’s tops the list. You are finally married and I wish you a long and joy filled conjugal life with your significant other. To be married is to accept an important phase of life which requires you to spend the rest of your life with one person. It takes brave men like you to accept this condition. I am proud of you, pal! Wishing you luck for your wedding day and a prosperous future all the way. Stay blessed. You get hitched today to the woman of your heart and I am overly excited to celebrate this occasion with you. I pray you and your queen will ride on the unfailing wheels of love and joy even after your kids join you. God bless you. Yours is a glorious day filled with lights, cakes, balloons, wine and loved ones. Remember that from today, your arms become the abode of the keeper of your heart. Hold her tight and put out your best in everything to make your bond even stronger. As you take this bold step today, it is my heartfelt desire that you will be armed with strength, health and power to overcome any obstacle in your life. May your marriage be as blissful as life in paradise. The reason why I am the happiest in the world today is because the love story that began during the Stone Age finally ends with a “happily ever after”. Wish you all the excitement that can be found in marriage. As you boldly put a full stop to singleness today, don’t forget that we are still friends and whenever you need me, I will be there for you. 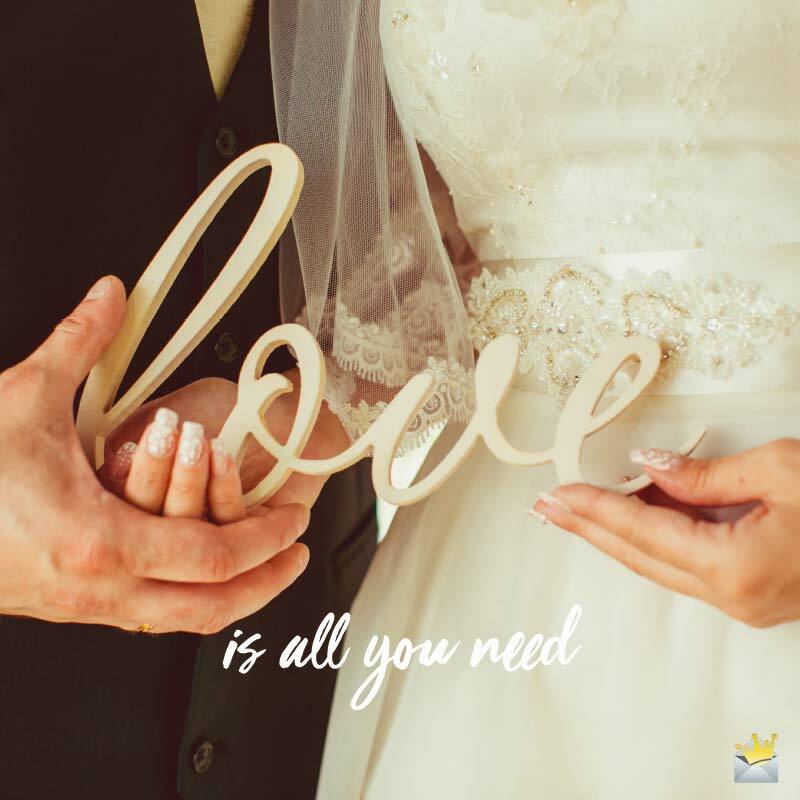 Have the best of weddings and a successful marriage. May your heart be filled with the sweetness of this day. May all the aspirations of your heart begin to realize from today. How lucky you are to find a significant other who is as wonderful as an angel! I hope you do all you can to make her the happiest wife on planet earth or you’d be hearing from me! Have a truly wonderful married life, my friend! I am happy that you are finally going to spend the rest of your life with the love of your life and the one who brings you all the happiness in the world! It is my wish that you will be immersed in your love for all your lives together. I have waited impatiently for this moment all my life! And I’m so glad it’s finally here! Dearest friend, as you make your way into the world of marriage, may your face forever beam with smiles and may your heart never lack joy for as long as you live. I wish the future of your marriage will be as beautiful as you are and as bright as the sun. Have a fantastic wedding and truly happy married life. Today is specially made and sent from heaven for you. Have all the fun you can because you are deserving of all joy, laughter and happiness that exist in the universe. From the depth of my soul, I wish you the best marriage ever on planet earth. May you share many more memories and years together. I feel so happy for you to have made another milestone in your life. I wish you divine strength and determination along this journey called marriage. All the best to you, my sweetheart! May the happiness your heart is currently overflowing with on your wedding day be with you until the end of time. Enjoy your married life to the max! On this extremely important day of your life, I want you to know that words can’t express how happy I am for you! May God bless you and make your marriage the happiest on earth. I love you so much, my friend. I wish you a brilliant wedding day and a married life filled with oceans of joy, passion and great health to last you for the rest of your life. May God forever bless your marriage. Though today will come to a close, your love and care must continue for the rest of your lives. Wishing you the best of luck today and on all the days of your lives together. May the true happiness and love you feel in your hearts today accompany you for the rest of your amazing lives. I’m truly honored to know a wonderful couple like you! Have a blissful marriage, my dears. It is my sincere wish that each minute of your lives together will be filled with paradisiacal joy. May you soar on the unfailing wings of love for the rest of your conjugal lives. We wish you heaps of sweet memories and oceans of love today and throughout your lives together. God bless you. Today is specially designed for you two. Have all the fun and excitement. Wish you the best of everything. May God bless you and take good care of your marriage. As you officially become husband and wife today, I wish that the love you share will encircle you with strength and joy wherever you find yourselves. Finally, the day we’ve been waiting for has arrived! It’s your wedding day and I wish you tons of laughter and joy. May every sphere of your married life bring you nothing but total bliss. Hardship and trials may come your way. But remember the important vow: “for richer and for poorer”. I wish your home will forever glow with heavenly lights and joy. Enjoy yourselves to the max. We are over the moon to know you are getting married. Keep your marriage love-centered and nothing will ever be able to put you asunder. Here’s wishing you long, healthy and a stupendously happy marriage. Remember that your first and foremost duty is to care for each other and all other things will follow in their proper order. Have all the fun you can! Truly anyone who catches a glimpse of you will readily conclude that you are two halves of a single soul. May your souls always be filled with joy and happiness such as can be found in paradise. May your Love only grow.